The first of October is "central heating day", when many people switch on their radiators for the winter. Central heating is just another mod-con of contemporary living, but it's done much more than warm us up. Up and down the country, radiators clank their way back to life after a summer of hibernation. 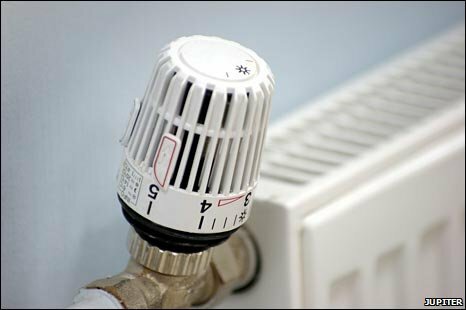 With energy bills soaring in recent years, and more people aware of energy consumption, many make it a point of principle that their heating stays off until the start of October, which means any nippy late September mornings just have to be endured. But given how mild the autumn has been so far, others may wait a couple more weeks before the big switch-on. Only a small fraction of UK homes are without central heating today. 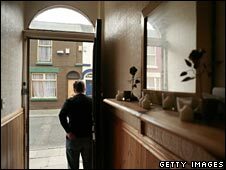 In the last comprehensive survey, in 2004, it was 7% of households, and that has probably dropped further since. Far from being a modern invention, there were forms of central heating systems in ancient Greece, and later the Romans perfected what were called hypocausts to heat public baths and private houses. In late Victorian Britain, well-to-do houses had a form of central heating. Cragside in Northumberland, the family home of engineer Lord Armstrong, was a famous example, with ducts built into the floors to carry warm air around the building. But it was a long time before central heating became widespread and affordable, and fired by a gas boiler. In 1970, Martyn Jarvis, 55, was a gas fitter, installing central heating systems in the Slough area. "Unless you were really well off, you didn't have any radiators. There was an awful lot of solid fuel around then, an open fire in the living room normally, which heated the water as well. "Other houses just had a three-bar electric fire, so you needed plenty of blankets at night. I remember the 1963 winter was particularly horrendous." By the end of that decade, and into the early 1980s, having central heating was regarded as a basic requirement, he says. I started in 1974 and central heating was just taking off. It was quite expensive then because it was a big job. There were obvious health benefits - warmer homes helped to address winter mortality rates - but the impact was wider than that. The design of a home changed because its inhabitants started behaving differently, says architect Harry Charrington. Today the average temperature in a home is 22C, compared with 18C in the 1950s, he says, yet people 50 years ago felt just as warm as we do today. "People don't wear clothing to keep warm any more. One of the social norms is that people can go around in shirt sleeves at home or in the office. So central heating has changed the way people think about clothing. "Rather than put extra clothes on, they put the heating on. It used to be that if it got cold, you put a jersey on and if it got warm you opened a window. People don't have an expectation that they will have to change the way they behave in cold weather." As well as a huge increase in energy consumption, says Mr Charrington, there were also design implications. Insulation like double and triple-glazing has become more common, and rooms are larger. "Everyone wants open-plan now, but you can only have open-plan with central heating. The traditional design of small rooms with a radiant heat source [a fire or stove] has gone." 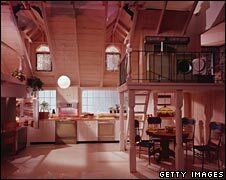 The whole loft-living idea wouldn't have happened without central heating, says Richard Sober, a lecturer in interior design at the University of Teesside. "People used to huddle in small rooms around a fireplace, but the television has probably taken over from the fireplace. "You used to need warm carpets and heavy curtains and drapes, whereas now people can live with laminate floors and floorboards. The typical Victorian home had very heavy materials and a curtain over every door to stop the draughts." People are also able to stay up later, he says. "People used to have to go to bed when it got too cold, even as late as the 1950s. Now people can sit up in a T-shirt and go to bed when they want to." The way the fireplace was no longer the focus of the British living room is still being felt today, says Eleanor John, head of collections and exhibits at the Geffrye Museum, which specialises in the changing style of interiors since 1600. Lots of Victorian and Georgian fireplaces were knocked out or covered in the 1960s and 70s, she says, and are now being revived. Central heating also meant the rise of the bedroom as a living - not just sleeping space - for children, rather than everyone congregating in the living room or kitchen, she says. So the teenager's domain, a symbol today for youth consumption and freedom from parents, was born. "So you could argue that central heating played a part in the start of the disintegration of the family." See George Orwell's essay on the advent of central heating in the UK just after WWII. He regrets the loss of the open fire as a focus of family life where everyone gathered, including the dog, to listen to the radio or read the news. We have central heat by fuel oil but added a modern wood stove which has a large transparent ceramic door two years ago as a supplemental heat source. We now use the central fuel oil heat just for hot water or on the coldest of nights. We have rediscovered the focus of the hearth. No family will ever become wistful about the pleasures of sitting around the central heating boiler on cold winter days. I previously lived in a cottage with no central heating, only a stove and a fireplace. Visitors remarked on how "delightful" it was to have an open fire, but they never considered the practicalities of the situation. It was COLD. In winter, ice would form on the inside of the bedroom windows. It was impossible to take a bath because the bathroom was so cold that after five minutes the bathwater had cooled below blood temperature. Overnight guests would look confused when offered hot water bottles and extra blankets, but would be very grateful for them by the morning. I now live in a small central-heating equipped flat, and couldn't be happier - although a few habits remain. The central heating doesn't get switched on until November, the thermostat sits at 15C, and I still have an impressive hot water bottle and blanket collection. I have all the benefits of central heating but fitted a wood burning stove to do two things. Reduce the usage of oil in my system and best of all give the family a place to sit comfortably with a focus. It's amazing how even the kids, when warm in their bedrooms, will still come down and sit around a wood fire. It's one of the best ways of getting the whole family together. And in winter a log fire chugging away with the dog in front of it and a glass of good whiskey is as close to heaven on earth that you will find. What nonsense to say we felt as warm then as we do now by putting on more clothes! In winter, going to the toilet, getting out of bed and anywhere not huddled in front of the living room fire was cold - relatively and absolutely. Houses were draughty and anyone leaving a door open would be howled at and there was always a pecking order as to who got warm and who didn't. Eiderdowns were often found in front of the TV with nobody willing to make a dash to the kitchen to put the kettle on. Central heating changed all that - thank goodness. I guess another trade that suffered because of central heating boom is the coal man, whom I remember with his sooted face hauling bags of coal up our driveway and into the coal bunker, one after the other. I remember my parents taking a lump of coal in through the front door and out through the back every New Year's Eve. Whatever shall we do now? If the average temperature of an English house is 22C, just think of the saving in cost and CO2 if most people turned it down to 18. I do not like to be cold but we have never run our house above 18, and have found that as we reduce drafts, even 17 is acceptable. Unless there are very young children or older adults who feel the cold badly, turning down the thermostat should not inconvenience anyone more than needing to find a jumper to wear. The cooler temperature would mean that the atmosphere was not so drying and the thermal shock of going outside would be less which might result in less colds. Being proud about energy saving is all well and good but you only live once and a warm house without shovelling coal/wood gets my vote. Jumpers/extra layers are so 1950s. I'm staying in Halls of Residence at the University of Leicester. When I arrived, on the 27th, the heating was on in my block, and the whole place was absolutely boiling. I went to the office to ask about how to turn the radiator off. I was informed that I cannot turn off the radiator in my room, but was advised to open the window, which I am still doing, since the room gets unbearably hot with it closed. I live on the 3rd floor of a modern apartment complex and benefit from the lower floors turning on their central heating throughout winter. Resulting in me not needing to turn the heating on at all. Bargain. I'll always remember those freezing mornings waking up with frost on the inside of the window and running to the bathroom to get washed for school. 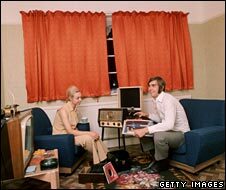 My parents couldn't afford to have central heating fitted - it was heaven when I got a wall heater fitted in my bedroom. Children today can't appreciate or comprehend what we had to go through growing up. My parents only had central heating installed last year and my mum is on cloud nine but my dad is still watching the pennies. We are moving house today from a little old cottage to a 1930s semi. The cottage has no gas link and is therefore in the miniscule minority of homes that are without central heating - just one open fire grate in the lounge. My partner had lived there for years before I moved in, and at first I couldn't believe that he managed without heating. Within a week I had acclimatised and now really feel it when I go to houses with the heating whacked up in winter. This time of year, we have always put on another layer. The fire is either lit or it's not and you can't switch it off or turn it down if you get too warm. I am looking forward to having heating, as it will be nice to come home to a warm house rather than light the fire and sit with your coat on for the first half an hour, but I won't be taking the system for granted and we will be restoring the blocked-up fireplaces. Given a choice, I would sooner not have the central heating - the radiators are in the most awkward places which makes it difficult to position any furniture, and wood is an infinitely cheaper fuel than gas. My central heating is turned on at 1 January, and off 28 February (unless it is a leap year when I allow myself the luxury of having an extra days heat). We are just finishing the refurbishment of an old cottage. It has central heating but this is run from a back boiler on a wood burning stove. Our hot water comes from the sun and we are also generating our own electricity. In rural areas like this we don't have the luxury of piped gas and with the price of oil spiralling we have decided to heat our house on wood. I do think that there is a move away from central heating as the only heat source in a house, due to the spiralling cost of gas, and the realisation that there is only a few decades worth of gas left to extract. My wife and I have recently installed a wood-burning stove in our dining room. This complements our central heating (which is itself only four years old) but allows us to try to economise on gas costs and yet still remain warm. My parents didn't have central heating until 1999 (and my Dad rarely lets it be put on now). My last flat didn't have ANY heating other than plug-in heaters, and was draughty and single glazed. I now have economy seven heating which I love - cheap and with double glazing, it is sufficient. I'd go to bed because it was too cold to stay up. It will take me a long time to stop the habit of keeping a blanket in the living room. Surely most central heating systems only come on when there's demand for heat from a thermostat - so why the "special" date of 1 October? My house isn't brilliantly insulated, but I still only need the central heating for a few weeks of the year. I still go to bed when it's too cold, and have curtains over exterior doors. I don't like drafts and I like the look of the curtains. And it stops people looking in. And I'm only 32, it's not like I've ever lived without central heating. During those 30 years I wonder how our carbon footprint has increased and how wasteful we were and perhaps still are. Although I couldn't do without central heating myself, I love going to my mum's house, as they have a wood burner in the dining room. We stayed over last Christmas Eve, and we all sat around the fire and had a proper conversation, instead of plonked in front of the TV saying nothing. It was lovely. Radiators just don't hold that kind of magic.